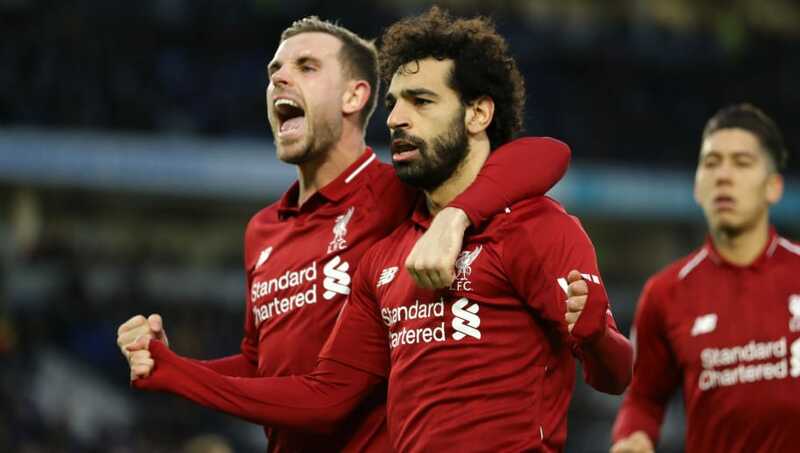 ​Liverpool skipper Jordan Henderson has called out critics of Mohamed Salah, who accused the Reds forward of diving in the Premier League win at Brighton. The away side won a penalty through Salah, after he went down under the challenge of Seagulls midfielder Pascal Gross and referee Kevin Friend pointed to the spot. The forward, who is now the joint top scorer in the league with 14 goals, dispatched the penalty - scoring the only goal in the game. Henderson feels Liverpool's star man has been unfairly criticised and likened his teammate to former Reds star Luis Suarez, now of Barcelona, by saying the criticism will only make Salah a better player. He said, as quoted by the​ ​Liverpool Echo: "Yeah Mo's the same [as Suarez]. If they try to put pressure on him, they will only make him better. It won’t bother him. He’s so strong, I know he is. He also went on to say their victory at the weekend showed that recent losses against ​Wolverhampton Wanderers and ​Manchester City have not affected the team's confidence. He added: “Look at the start of the season up until this point, we’re full of confidence and we are all together with a strong mentality. "It was just a great opportunity for us to get three points. It’s that simple. We don’t have to go out and prove anything to anyone. "All we have to keep doing is having the belief in ourselves to go and win games. We have done that all season, so why change?" The England international also praised Fabinho after the ex-Monaco midfielder filled in at centre back, partnering Virgil van Djik due to injuries in Jurgen Klopp's squad. Henderson said: "Fab stepped in at central defence and did a fantastic job. He obviously had Virgil helping him out and we had control of the ball so we didn’t have too much to do. What he did do, though, was brilliant. He’s a quality player and a big help for us." Liverpool continue to lead the pack and are four points ahead of ​Manchester City, who beat ten-man ​Wolves 3-0 on Monday night.